Exquisite shot and beautiful quote. I love yellow flowers they are happy, smiley, positive full of life wonders! Beautiful! That's one of my favorite quotes. Is that a button bush? 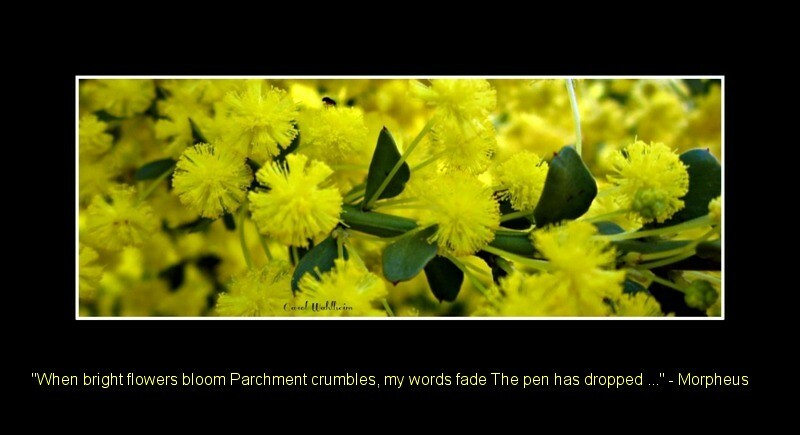 Thanks everyone and here is a link to out treasured native the Golden Wattle. Beautiful Milli and Love the quote too~!! I didn't know they were Australia's floral emblem... Nice picture and quote! Thanks for your comment, Millie! "The pen has dropped." Yeah, because you've just had a heart attack! Quick, somebody call 911 !!! Haha no I lost Emmy Muse. nobody can beat ur flowers or ur sunsets ! Aww thanks Sonny. Maybe they are my signature photos like you have your Sonny Signature Photos. That is beautiful Milli and of course the colour yellow brings happiness. Yellow for me does mean bright and happy. Thanks.